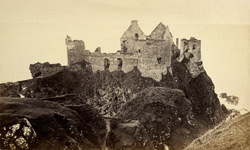 "The bold ruin of Dunluce occupies the summit of a detached rock overhanging the high-swelling waves of the Atlantic. It rises one hundred feet above the level of the sea, and its perpendicular sides appear as if forming part of the walls, while its base, by the continual action of the waves, has been formed into curious caverns, which communicate with the castle; they are capable of containing a number of boats, and in them numerous spars and crystallizations are to be seen. The first founder of the Castle has left no record of his name, but its after history supplies many incidents of interest in Irish story. The MacQuillians were amongst its earliest proprietors; the MacDonalds of the Isles succeeded to its possession, and the widow of the famous Duke of Buckingham was once its mistress and inhabitant. It is now the property of the Earls of Antrim. Its picturesque character is superior to its architectural. In the less accomplished ages of military skill this must have been an impregnable fortress; the gulf which separates it from the shore was crossed by two parallel walls, about fourteen feet asunder, upon which the drawbridge rested. This was the only mode by which the castle could be entered, the rocks on all sides being wholly inaccessible. The castle is built of columnar basalt, in many instances so placed as to show the ploygonal sections; it contains a small court-yard and several apartments of considerable dimensions. There is a small vaulted room on the eastern side, called the Banshee's Tower."